For some people buying a car can be a little bit like buying an appliance. Sure, you want a nice, reliable option that has a few convenience features, but it doesn’t have to offer all the latest and greatest. Still, there are other customers who dream big and look for vehicles that truly excite the senses. For these people, deciding between the 2016 Volkswagen Golf GTI vs 2016 Volkswagen Golf R is about deciding between a model that is fun, and one that is extraordinary. If price wasn’t a consideration, the winner in this comparison would be obvious. We don’t know many people who don’t consider cost when shopping, however, which is why we get many shoppers who debate whether the Golf R is worth is when its basic DNA still comes from the Golf. After all, the Golf did start out as a basic grocery-getter, but the Golf R proves Volkswagen has taken a solid model and turned it into something great. There can be little doubt that both the 2016 Volkswagen Golf GTI and the 2016 Volkswagen Golf R are fun models to drive. 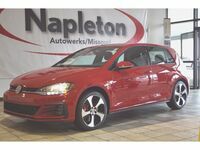 The GTI offers ample power and has an available performance package that not only boosts it further, but adds on larger vented disc brakes and a VAQ limited-slip differential. When comparing it to the Golf R, it tends to fall out of the spotlight, but it is a great car all on its own. The pricing also happens to make it practical and affordable for a wider variety of people. Still, the 2016 Volkswagen Golf R offers better performance with standard 4Motion AWD, large vented disc brakes, sport suspension with independent MacPherson struts and the XDS+ Cross Differential system. This isn’t even to mention the 70 extra horsepower over the GTI with Performance Package or the optional dynamic chassis control system. When it comes to performance, the model clearly excels. The 2016 Volkswagen Golf R isn’t exactly skimping when it comes to features either. Standard features in the 2016 VW Golf GTI include Bluetooth, and eight-speaker touchscreen sound system with App-Connect, LED foglights, a rearview camera system, heated front seats and Clark Plaid upholstery. The VW Golf R updates these features and adds on dual-zone climate control, three-mode electronic stability control, keyless access with push-button start, automatic Bi-Xenon headlights and leather upholstery. Between more impressive engine specs, performance parts and convenient features, it’s obvious the 2016 Volkswagen Golf R is an enthusiasts dream, but you can’t argue with the price of the 2016 Volkswagen Golf GTI. Stop by Napleton Volkswagen Springfield to learn more about either model.